THE BUSINESS OF PHOTOGRAPHY IS BACK!Over time photography has evolved from being just an art to being a profession. Gone are the days whenphotography was a side hustle or a means to make ends meet. Photography today requires much morethan skills and a good eye as the photography industry has become very lucrative and competitive. 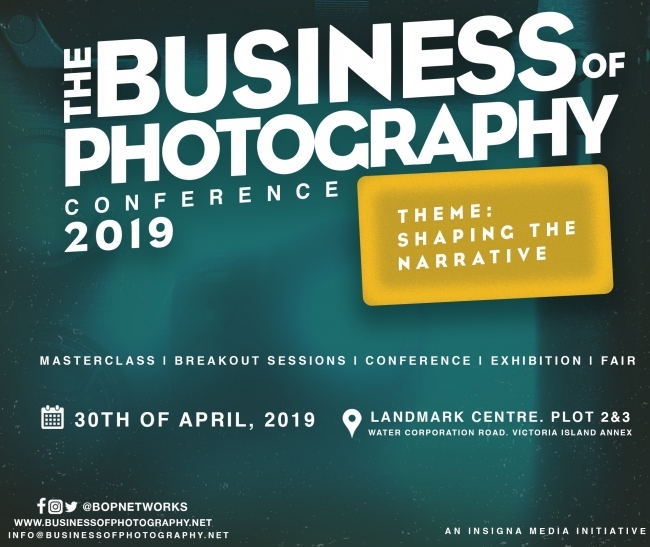 The Business of Photography Conference is an event that seeks to proffer solutions to the problems thatphotographers face in the course of carrying out their various activities. Asides from helping photographersget better at their craft, The Business of Photography Conference is also aimed at converging Photographers, photography manufacturing and servicing companies as well as photography retailerstogether under one roof to discuss, learn, exhibit, sell and buy everything photography. This year’s edition set to hold in April is Themed: “Shaping the Narrative” will be bigger than the firstedition which took place in April 2018. The first edition had over 1,000 participants in attendance withpanellists including, Yetunde Ayeni Babaeko, Wani Olatunde, Emmanuel Oyeleke, Kelechi Amadi-Obi, Shola Animashaun, Oyinkan Badejo-Okunsanya, Bukky Karibi-Whyte, Georgette Monou and many moreas panellists speaking on different topics affecting photography in Nigeria, master classes on specificphotography areas were handled by TY Bello, Yetunde Ayeni- Babaeko, Hakeem Salaam and KelechiAmadi Obi. The conveyer of The Business of Photography Conference, Kola Oshalusi promises that this year will bemore exciting and well packed than the last one with more activities, master classes, panel sessions. Bullet Description: Business of photography, creative minds, learning ground, shaping lives of individuals.